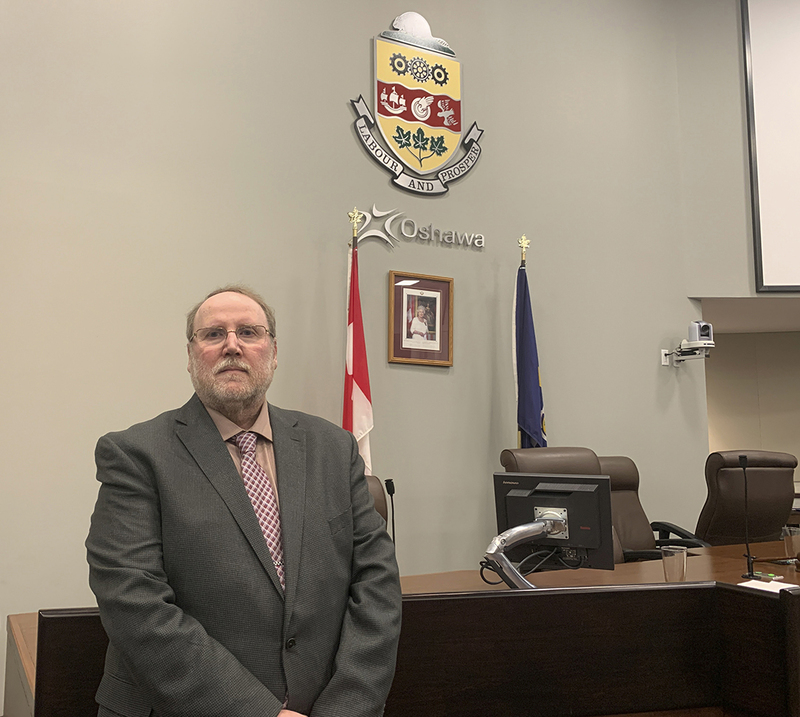 A review of Ontario’s regional municipalities is on Oshawa’s radar after a recent council meeting. Under Premier Doug Ford, a review of eight of Ontario’s regional municipalities, including Peel, Niagara, Muskoka District and Durham, is taking place in hopes of finding more efficiencies, perhaps by merging some regional and city councils. The review is being done by two provincially-appointed advisors, former Waterloo chairman Ken Seiling and retired deputy minister, Michael Fenn. It will include meetings with city officials and stakeholders, as well as public feedback. At council’s March 18 meeting, Bradley Marks, city councillor in Ward 3, proposed a letter be written to the premier outlining Oshawa’s stance on the review: That Oshawa remains the City of Oshawa and has no interest in joining with other municipalities such as Pickering, Whitby and Clarington, to become the City of Durham. Whitby council passed a similar statement on March 4. Oshawa Ward 5 Regional and City councillor Brian Nicholson suggested public voices be heard at a public meeting before comments are sent to the province. The public meeting would be a chance for Oshawa residents to share their concerns and comments on the review, which will be received by council but also sent to the provincial government. Nicholson said currently the process of government is “top-down” and non-inclusive and should be “bottom-up”, by talking with the public through meetings and being open to other forms of communication. “Rather than telling the voter or the taxpayers what you want to do, why not ask them?” Nicholson said in an interview after the meeting. Nicholson said asking people, to create an interactive form of government, is important. “If you listen more and talk less, you may achieve more,” said Nicholson, who was first elected to council in 1985. Nicholson also said change needs to be based on facts, not political agendas. Tito-Dante Marimpietri, regional and city councillor for Ward 2, the ward for Durham College and UOIT, supported Nicholson’s idea for a public meeting. Marimpietri added the province should look for efficiencies in other places as well. “The province may have to look in on itself for a review of how they provide us with services and how we’re able to gain the service of the province without the red tape and the costs that are incurred,” he said. The review process could last until September to fully report findings. Oshawa council agreed to hold a public meeting on the provincial review to get the input of city residents, which must be forwarded to Queen’s Park by April 23. No date has been set for the meeting. Previous articleI think I can, I think I can, I can!